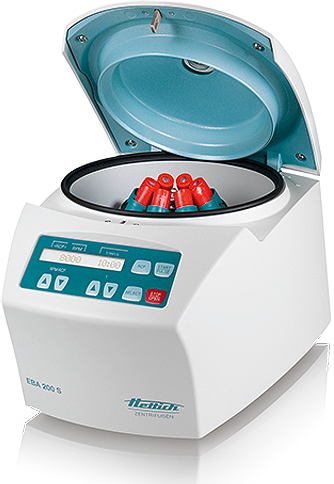 The EBA 200 is a compact clinical centrifuge offering performance and safety for small sample volumes. The EBA 200 features a built-in, versatile, 8-place, fixed-angle rotor and adjustable LCD display for convenient and quick operation. The higher performance “S” version is best for a quick turnaround of time sensitive samples and delivers an RCF of 6,153 making it ideal for STAT, PPP and Coag. Achieve consistent platelet in just minutes for Platelet Poor Plasma (PPP). The EBA 200 S provides rapid separation for a quick turnaround of your STAT chemistry, coag. and pediatric samples. Achieve consistent platelet counts in just minutes. Max. speeds of 8,000 RPM in a fixed-angle rotor. Shown below are the most common application packages for the EBA 200 centrifuge. Custom packages are available, please inquire for details. The EBA 200 Blood Tube Package 8 comes complete with everything you need to perform your application. 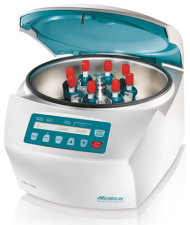 This includes the EBA 200 centrifuge, built-in, fixed-angle rotor and adapters for 13 x 75/100 mm blood tubes. In addition to this package, many a-la-carte options are available, contact us for more details. The EBA 200 S Blood Tube Package 8 comes complete with everything you need to perform your application. This includes the EBA 200 S centrifuge, built-in fixed-angle rotor and adapters for 13 x 75/100 mm blood tubes. In addition to this package, many a-la-carte options are available, contact us for more details. The EBA 200 Pediatric Tube Package 8 comes complete with everything you need to perform your application. This includes the EBA 200 centrifuge, 8-place built-in, fixed-angle rotor and adapters for 10.7 x 36 mm tubes. In addition to this package, many a-la-carte options are available, contact us for more details. The EBA 200 S Pediatric Tube Package 8 comes complete with everything you need to perform your application. This includes the EBA 200 S centrifuge, 8-place built-in, fixed-angle rotor and adapters for 10.7 x 36 mm tubes. In addition to this package, many a-la-carte options are available, contact us for more details. The EBA 200 Urinalysis Package 4 comes complete with everything you need to perform your application. This includes the EBA 200 centrifuge and a built-in, fixed-angle rotor for KOVA tubes. In addition, many a-la-carte options are available, contact us for more details.